The first time I thought it was a quirk. The second time I thought it was a coincidence. The third time I would have sat up and taken notice—but I couldn't sit up. And the fourth time my back went out—leaving me supine for a week, except for when I crawled to the bathroom—I was forced to take action. What undid me at last was the simple, perfunctory act of bending down to tie my shoe. I leaned down and wham, my whole left side crumbled like a graham cracker. I spent the next week in a fetal position on the bed, relieved only by visits to a physical therapist, a chiropractor, and an acupuncturist. Low back pain should really be called spine pain because that's where it originates. My story is not uncommon. Up to 85 percent of Americans will suffer back pain in their lifetime—and the number of people with chronic, debilitating low back pain is growing. The likely reason: rising rates of obesity and stress, says Timothy Carey, M.D., director of the Sheps Center for Health Services Research at the University of North Carolina at Chapel Hill, and the author of several recent studies on low back pain. Despite the pervasiveness of the problem, there are few clear guidelines on how to properly diagnose and treat low back pain, leaving sufferers like me to try one therapy after another. Thankfully that disjointed approach is starting to change, as a slew of new research sheds light on what works and what doesn't. I've consolidated that research here—and consulted half a dozen experts in low back pain—to help you ease your agonizing aches. It's often hard to pin down the exact cause of a person's back pain—unless you have pain accompanied by a red-flag symptom such as numbness or weakness of the legs or feet, changes in bladder control, fever, or night sweats, or you have a history of cancer. In such cases, health care professionals agree, get to a doctor pronto. Technically speaking, back pain may be the wrong nomenclature. It should really be called spine pain because that complex of bones is the center beam of the system that holds us erect. The adult spine consists of 26 bones, called vertebrae, divided into three areas—the upper (cervical), the middle (thoracic), and the lower (lumbar). Picture a stack of pancakes, with butter between each pair, all loosely held together by maple syrup. The pancakes are the vertebrae, the butter pats are the water-absorbent discs between the bones, and the syrup is an intertwining collection of ligaments, joints, and muscles, all tangled with the cables carrying nervous system signals—among them, pain. Even if you weren't born with a musculoskeletal irregularity, such as curvature of the spine (scoliosis), your discs wear out over time: they're the shock absorbers for your body weight. As you age, your bones become weaker, and you may develop osteoporosis (which can lead to fractures) or osteoarthritis (a breakdown of cartilage that may cause bones to rub together). Add a simple misstep—like my ill-fated bend to tie my shoes—and it can topple the stack. So what should you do if you feel low back pain? First ask yourself: is the pain acute or chronic? Here's the difference: acute pain feels like a sudden stab followed by a burning sting, so painful it can immobilize you. People often say it feels like "something snapped." That snap may be a muscle stretching so far it tears like a frayed rubber band. Acute pain ends in a day to several weeks. Chronic pain may have started as acute but never went away. If pain lasts longer than three months, it's chronic. The general rule for acute pain is to ice the injured area for 20-minute intervals to reduce inflammation and swelling, says Marilyn Moffat, D.P.T., Ph.D., professor of physical therapy at New York University. After 72 hours, switch to heat, which soothes muscles. Plus, heat works well on muscle spasms, involuntary contractions that send pain signals to the brain. After the initial pain passes (and you've made it to the couch with an ice pack), the next question is: lie still or move? Until recently, doctors advised those with acute back pain to lie in bed until the pain passed. But a 2005 study found that people on bed rest have more pain and a slower recovery than those who stay active. "Muscles lose mass remarkably quickly when you don't exercise them," says Moffat. Just when you need those muscles to work harder to hold you up, they will be weaker than ever from lack of use. To aid movement in the early days of pain, she often has patients wear a lumbosacral corset, which supports the lower back. In recent years, as the numbers of patients with low back pain have increased, physicians have more frequently referred patients for medical imaging (MRIs, CTs, or radiography). This is troubling for several reasons, says Raj Rao, M.D., director of spine surgery in the Department of Orthopaedic Surgery at the Medical College of Wisconsin. For one, a study published in February in The Lancet found that low-back-pain sufferers who underwent medical imaging did no better than those who did not get imaging, despite the hefty price tag (an MRI can cost $2,000). Unlike many other diagnoses, the discovery of an abnormality in your spine doesn't necessarily mean you've found the cause of your pain. For instance, 5 percent of those with a herniated disc—in which the disc's gelatinous center pops out of its fibrous covering into the spinal canal—feel no pain. For other people even a slight bulging of a disc causes intense discomfort. Rao sees this all the time. "You can look at the MRIs of two people, both showing degenerative discs, but in one case there is little to no pain, while in the other, extreme pain," he says. "On the other hand, you can see a healthy spine but the patient has severe pain." The doctor's first job, then, is not to find the cause of your pain, but to alleviate it. "Seeing images of bone spurs or crushed discs may only add worry, as those problems may not be related to the patient's pain," Carey says. Rao and Carey usually wait a month to six weeks after the onset of a patient's back pain before ordering an MRI, unless there are red-flag symptoms. "I think of MRIs as a preoperative study," says Carey. "When the pain is bad enough and long-term enough that an invasive treatment becomes part of the conversation, then an MRI may be called for." Part of the frustration in treating low back pain—both for the physician and for the sufferer—is that outcomes vary so dramatically from one patient to the next. Although acupuncture might offer relief to one person, it may do nothing for another. Neurologists speculate that this may be due in part to the way pain signals travel up the spine to the brain. It also may be because most people who see a doctor for low back pain actually have several things wrong with their back. (In my case, an X-ray showed how a slight case of scoliosis was aggravating degenerating discs and bone spurs that were developing.) "At this point we have no way to test for—or treat—multiple back problems in isolation, so we have to resort to hit or miss," Rao explains. That said, emerging research suggests we're getting closer to discovering what works best. A review in the February 2009 Journal of the American Academy of Orthopaedic Surgeons concluded that physical therapy combined with nonsteroidal anti-inflammatory drugs (such as ibuprofen or naproxen) is the most effective treatment for degenerating discs. According to the American Association of Neurological Surgeons, 90 percent of herniated discs can be effectively treated with conservative therapies such as limited bed rest, exercise, and anti-inflammatory medications. This would be heartening but for a study in the February Arthritis Care & Research, which found that fewer than half the participants who saw a health professional for back pain in the past year had been prescribed exercise. I personally made some groundbreaking discoveries about physical therapy not long after becoming ambulatory again: staying healthy can be hard work, and it doesn't always feel so great. "You may feel some pain when you start physical therapy, even if it's just walking," says Carey. "This is normal." If the exercise consistently causes greater pain than the initial pain in your back, stop doing it and check with your physical therapist. But if the pain seems to lessen with each workout, you're on the right track. If physical therapy isn't doing the trick, it's time to try other approaches, says Jack Stern, M.D., Ph.D., a neurosurgeon and senior member of Brain and Spine Surgeons of New York, in White Plains. Here are a few of the most commonly prescribed therapies for chronic low back pain—and the potential benefits of each. • Chiropractic - To clarify a common misunderstanding: chiropractors don't "crack your back." That popping sound is a gas bubble being released from between two joints that have been coaxed into alignment. A study published in 2002 found that patients with low back pain treated by chiropractors showed greater improvement after one month than those treated by physicians. • Acupuncture - The needles used in acupuncture may work by stimulating the nerve fibers that transmit signals to the spinal cord and brain, which then release hormones that make us feel less pain. If conservative approaches do not work, many physicians refer their patients for more invasive procedures—typically injections or surgery. • Injections - A neurologist sometimes injects anesthetics, steroids, or narcotics into the soft tissues and joints around your spine to reduce inflammation and relieve pain. One of the most commonly injected medications is a synthetic version of cortisone, which is a natural steroid released by the adrenal glands when your body is under stress. However, a review of studies found insufficient evidence that injection therapy is more effective than other treatments. 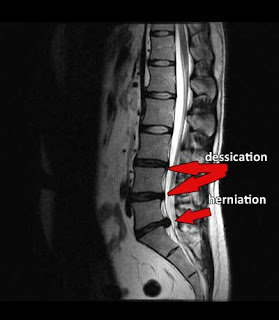 Discectomy, or surgical removal of part of the damaged disc, is most often performed on herniated discs. A 2006 study, though, found that lumbar discectomy offered only modest short-term benefits. Laminectomy is the removal of part of a vertebra, and is used in certain cases of spinal stenosis or spondylolisthesis to decompress the nerve. Spinal fusion is the fusing together of vertebrae using bone grafts and metal rods. In a 2001 study of patients with severe long-term back pain, pain was reduced by 33 percent after two years for those who had spinal fusion, compared with 7 percent for those who received more conservative treatment. There's an old Zen saying: "Before enlightenment, chop wood, carry water. After enlightenment, chop wood, carry water." It means no matter how much you know, you still have to take out the garbage. The difference is you take it out with more consciousness. I feel the same way with my acquired wisdom about back pain. Even after voluminous research, I know that one false move, one stumble, and I could be flat on my back again. The difference is that I now know how to treat it. Now, I can say, I've got my own back's back. Perry Garfinkel is the author of Buddha or Bust: In Search of Truth, Meaning, Happiness and the Man Who Found Them All (Three Rivers Press). Great post! I also suffer from my back pain after work, I think I need to use this tips to prevent my back pain from aching. Thank you very much for sharing this informative post. It really help and I learned a lot. Keep posting!